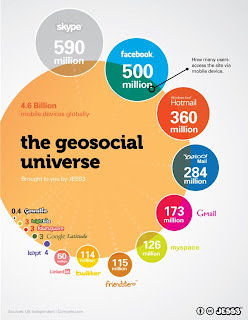 Because you love info graphics so much, JESS3 created a graphic illustrating the number of mobile device users that have adopted each of the major social tools, and then how many of those users are accessing the tool with a mobile device. + Going mobile. Look toward the bottom of the graphic where the newer tools are coming into play. With the exception of Friendster (lol! ), we're becoming more mobile. Naturally location based tools are driving this, but even nearly half of the Facebook audience is accessing via mobile devices. What does this all mean?? It means that you need to pop this graphic into a presentation deck, and ask your boss for boku budgets to support your social marketing plan. Post haste.